Concrete may be an affordable material but it is still an investment property owners make. That is why when they see a single sign of wear and tear, it can be quite frustrating for them. If you are on the same page and are experiencing stress over the damage that has started to present itself on your concrete floors, worry not. Polyurea polyaspartic is a coating that will bring that smile back on your face. Polyurea polyaspartic is a two-part material, similar to epoxy, that is best used on garage floors, basement floors, commercial spaces, and industrial concrete surfaces. It was originally developed to protect the floors of industrial facilities, such as power plants, factories, and others where the floors are often exposed to extremely damaging elements. The coating creates a smooth and seamless surface. Although beautiful as it is, you can further enhance the look with multi-colored paint chips. It is a fast-drying material. While epoxy floors and other coatings would require a few days to actually cure and dry, polyurea polyaspartic dries within a few hours and is totally cured and ready for use the next day. Nothing can harm it. It is resistant to most types of damage that are common on floors. It is highly resistant to scratches, abrasion, chemical spills, and more. Polyurea polyaspartic can be installed in both indoor and outdoor settings. It is not sensitive to UV rays so it should maintain its appearance and durability despite exposure to sun and rain. It contains low volatile organic compounds or VOC, making it an eco-friendly solution to concrete issues like cracks, holes, dents, discoloration, and more. Call (720) 545-1766 to find out if Polyurea Polyaspartic is the right one for you. Updating or repairing a concrete floor can be quite stressful, especially because it involves precious time and hard-earned money. 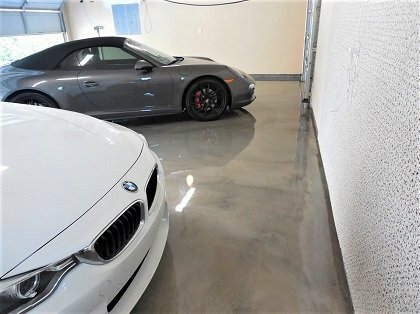 Denver Concrete Artisans knows how important projects like these are so we make sure that we provide you with the best Denver garage flooring option that will be worth your investment. Our team of expert installers is highly trained in installing polyurea polyaspartic coatings for both residential and commercial concrete spaces. We pay great attention to detail, making sure the coating is mixed right and that not a single spot is left out. We’d love to discuss more about this wonderful coating. Call us to request your free, non-obligatory on-site inspection and quote today!